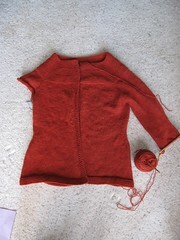 I’m getting close to done with the Garger Yoke Cardigan. I’m about halfway through the first sleeve. See? One thing I find super annoying about knitting sleeves on top-down sweaters is that I have to spin the whole lump of sweater around each time I change needles so that the knitting will hang straight. Kinda tedious, but it would bug me more to not have the knitting hanging straight. I’m excited to get this sweater off the needles and blocked. Right now, the edges want to curl a lot, so even when I try it on to see how it looks, it’s hard to tell. I added some length to it and I’m a little worried that I might have added too much, and it seems a little big. But it may just be the perfect size to be a nice, cozy, loungy type sweater. I’m also going to add length to the sleeves. The length listed in the pattern didn’t seem right, but then I looked at the picture and saw that the sleeves are actually short to allow for an under layer to show through. But I’d rather have them longer. I also finally got to start a weaving project after letting my loom lie dormant for quite awhile. Usually I sit down and warp it in one afternoon or evening, but this time the whole warping process got spread out over two weeks. My first setback was that I used a couple of skeins of yarn I’d intended to use for a hat, and used the “cross your fingers” method of finding out whether or not I had enough yarn. I didn’t, and had to order more and wait a week before I could finish measuring out the warp yarns. 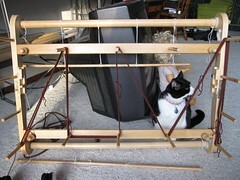 Then, we took a weekend trip to Duluth the day after the yarn got here, so I couldn’t get the warp all set up on the loom. I’m mostly dead when I come home after work every day, so working on weaving wasn’t an option until yesterday. I don’t have a picture of my current progress, but here’s a picture I took of using the Kromski Harp’s pegs as a warping board. Is it just me, or is winter dragging on? I have been feeling pretty lethargic the past week or so, and I’m thinking winter is partly to blame. I also had a cold last week that I think is sticking around mildly in my system, so maybe that’s to blame, too. But the monotony of all the white around me and the lack of daylight is dragging me down. I would almost rather have it snowing every day, because I love new snowfalls. But instead it’s mostly mashed down footprint snow, plowed gray chunks of snow, nasty parking lot slush, and melted then re-frozen ice. It doesn’t help that I get home fairly late, and after eating dinner and washing dishes I barely have much time to myself. Last night I could have gotten some knitting done, but I made the mistake of closing my eyes for a bit, and I slept for around two hours on the couch before getting up to relocate and actually go to bed. 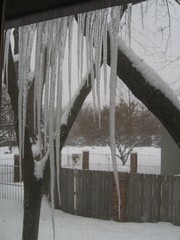 The picture is of the icicles that have formed outside our kitchen window. They look really cool and have gotten really big, but the picture only really serves to illustrate my dreary feelings about winter right now. So gray! 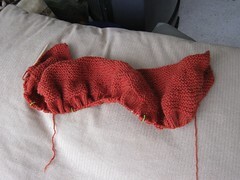 I have been making progress on the garter yoke cardigan, but have no pictures to show for it right now. I only have a few inches left on the body, then I have to start the sleeves. I want to finish it quickly so I can start a new project with this pretty yarn. Actually, two new projects. The Nature Spun is for a two-color mitten project, but I don’t know which pattern I’ll use yet. I want to practice stranded colorwork with a pattern, because I have a cool pattern idea of my own but I need to get familiar with the technique first. 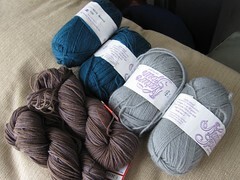 The brownish yarn is for socks for my cousin’s husband. For a White Elephant gift game at our family holiday party, I wrapped a box of cookies and attached a coupon for a handknit item of the recipient’s choice. It became the hot gift of the party that everyone wanted to steal! Little did they know that I wouldn’t even be starting the knitting until February…oops. One entertaining thing about this winter has been our compost bucket. We started a low-tech compost system of collecting it in a bucket on the deck outside the door in our kitchen and then bringing it to a pile in the backyard. 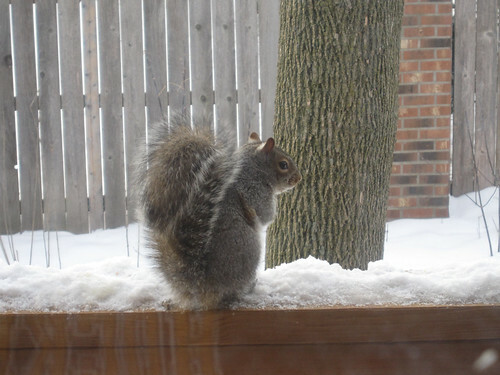 Once winter set in, the squirrels of the area got clued in to the fact that we have food scraps there, and so now we have a steady stream of furry visitors. The cats can be caught staring intently out the windows all day now. Look at this little chubby guy! Cute cats and a new necklace! The top one is Tashi, my baby kitten who’s not so much of a kitten anymore. He’s taken a liking to that big squishy pillow that is covered in polar fleece, and can be found napping on it no matter where it is relocated day by day. It matches his squishy face. The bottom picture is Mr. Mao, my brother’s kitten, who is all kinds of adorable wrapped up into a tiny, skinny, clueless package. 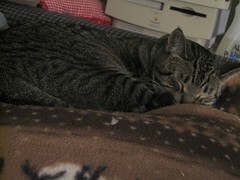 Someday I will have to get a recording of his adorable meow, because it is, well, adorable. He has a distinct preference for cuddles from my brother and no one else, but if he’s very desperate he may deign to sit in my or Chris’s lap for about 3 minutes tops, every few months. We take advantage of these moments, for he is the cuteness. Yesterday I took a break from all the knitting I’ve been doing on my Raglan Yoke Cardigan and finished a necklace I’ve been meaning to fix for a long time. It’s very simple, but that’s exactly how I think it needed to be. 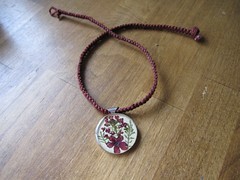 I got this dried flower pendant in Argentina at an outdoor market, or feria. When I got home I made a cord for it by braiding some of the same maroon hemp, and attached it to a clasp, but one of my knots untied and it’s sat, broken ever since. I found it the other day while looking for some other jewelry and decided to finally fix it. I just did a simple square-knot cord and, after experimenting with different ways to string the pendant on, decided to just stick all the cords through the hole instead of one or the other and trying to tie around it. I think it turned out pretty well, and it doesn’t slide on the cord but holds firmly in place, which is exactly what I wanted. A good accessory for a Valentine’s Day dinner! I’m not anti-Valentine’s day, but I am anti- all those commercials that seem to claim that the only way to really show a woman you love her is to buy diamond-encrusted jewelry, and that imply that it’s only the men who need to do the gift giving. The things I’ve always liked about Valentine’s day are chocolate and the chance to hang out with people I love, be it friends or a significant other. Which are pretty much the things I enjoy about every holiday, really. Since this Valentine’s day was the first one since I was in eighth grade that I did get to spend it with a significant other, I was kind of excited. We made it low key but special. We had dinner at the Pizza Luce in Uptown, which was where we ate on our second date, which was also the date on which we made things “official.” Then, wanting dessert but not wanting to buy a huge brownie fudge sundae at Luce, since those can feed 5 people, we headed to the grocery store. We were going to get ice cream, but the idea of a hot fudge brownie sundae was stuck in our minds. Then, the genius idea was born. We had brownie mix at home, why not buy vanilla ice cream and hot fudge and make fresh ones ourselves? Brilliant! So, we didn’t even have to take the chance of getting a stale, crusty brownie, and we got to share with my brother and his friends, who were hanging out playing video games and watching the Olympics with us. And, since it’s always nice to be appreciated, it was great to hear them say “This is the best day ever,” when we offered to share 🙂 Indeed it was. Wow. Silly me. I seem to have photographed it inside out. Oops! Also, I am quite a bit farther than that now, as I have been sitting in front of the Olympics and chugging out rows, but at least you can see that I got past the sleeves and am on the body. I’m a bit worried because my row gauge was way off from the pattern and I’ve only made minimal adjustments. I hope it turns out awesome, though, because I’ve been wearing my new brown cardigan as much as I possibly can, and I am now hungry for more handknit sweaters! I want to be a shawl person. Lately I’ve been seeing pictures of people’s gorgeous knitted lace shawls around and I’ve thought, “I should knit more lace shawls, and become a shawl person.” I’ve worn shawls off and on before, but not regularly, and I never quite feel like I’m pulling it off. Perhaps it’s because most of my wardrobe is pretty casual. However, this month at work, the idea was born in our AmeriCorps cluster to make every weekday of February a theme day. We wrote ideas on scraps of paper, made up a little calendar, and randomly picked themes for each day. Then, we decided that every day we’d vote on whose outfit we liked best. The challenge has been conforming to the theme while still managing an acceptable work outfit, because, unless someone noticed that we were all wearing plaid on Thursday, nobody in the school knows we’re doing this. So on Disney Character day, for example, outfits were loosely interpreted. The thing that surprised me is that I’m noticing how much more fun it is to get dressed when I take a chance with my outfits. Yesterday was the biggest for me. I haven’t worn any dresses or skirts since the summer, because I don’t have warm tights, or any money to remedy that. But Thursday was “Dress like Annie” day and she wears lots of skirts and dresses. She also layers. So, I took the chance to wear a dress I’ve had since high school that I’ve never worn. It’s dark denim, and I wore a purple shirt under it for longer sleeves. I had some black leggings that I bought to use as long underwear last winter and some tall socks to remedy the cold legs issue. I totally won the day because Annie just happened to be wearing a navy blue dress the same length as mine, with a similar purple shirt underneath it. Besides that I totally won the votes for that day, I also won because I discovered that I love this dress despite whatever reservations I had before about wearing it! 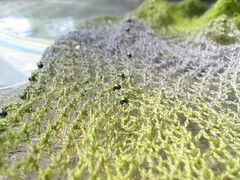 So, the moral of the story is, maybe I can be a shawl person, if I ever get around to knitting some shawls for myself. I currently have two shawls in hibernation, waiting to be finished, and both are intended for friends. One of them is Muir from Knitty, which I started a looong time ago, maybe a year and a half, for my best friend. It’s one of those projects that I have to give my full attention to, rather than sit in front of a TV show and knit, so I find myself doing less knitting on it. I need to get back to it. 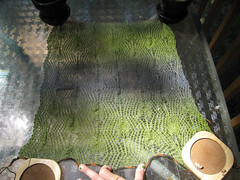 It will be great when it’s all finished and blocked, but right now the lace pattern is all mushed together. As it should be, though. I finished it! Last night I finished the second button band and added the collar, and voila! My first successful completed sweater. It fits me, and I like it, and it’s going to be cozy. Just as soon as I weave in the ends and block it. I was a little iffy about the buttons when I first sewed them on. 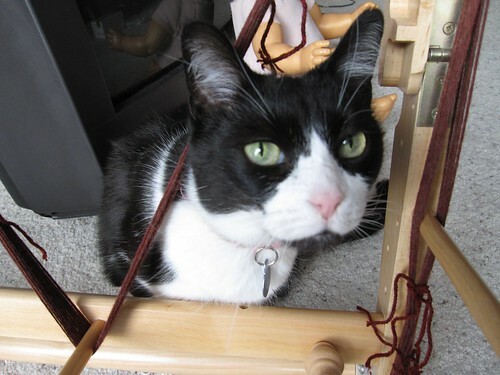 I bought them when the sweater was still in its early stages, knowing that I wanted a wide button band and chunky buttons, but I didn’t compare the color of the yarn to the color of the buttons when I was in the store. However, now that it’s all completed, I think I like it more. At first I thought they looked kind of clownish. One thing that bothers me is that, when I button the sweater, the buttons pull at the holes and make the button band look wavy. I think that’s because it’s slightly too small for me, sadly. It’s not too small to wear, it just is a little too small to button up comfortably. I think it’s a small enough difference that I can probably try to block it a little bigger. I’m also thinking that the button holes are too big, and I may just take a darning needle to them and sew them closed a little smaller. Then maybe they won’t pull so much? I’m not sure. 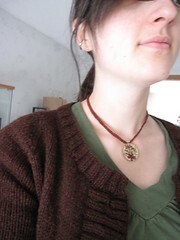 But, this sweater is by far the most wearable sweater I have ever completed, and I’m very proud of myself. Pattern: The Incredible, Custom-Fit Raglan Sweater. 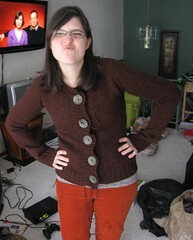 I actually found photographic evidence that I started this sweater much earlier than I’d previously thought. I thought that I’d started it sometime in August or September, but I discovered this photo of myself knitting the sweater on a rooftop in Guanajuato, Mexico. I went to Mexico with my friend Erika, who was going for a month to take Spanish classes. While she was in class, I had to find things to do, and after wandering the city for the first few days, sitting on the rooftop of the hostel knitting seemed as good a thing to do as any. That was during the first week of June! This sweater sat around, unfinished, for a very, very, long time. Sadness. 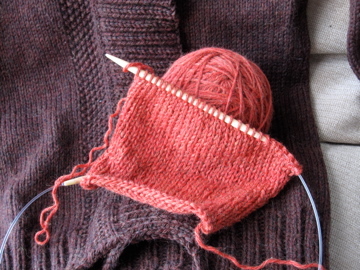 While I have this sweater momentum going, I’m starting a new one. I’m crossing my fingers that I’ll have it finished in time to wear it a little bit this winter! At the very least, there is always a lengthy period of spring where it’s cold enough to wear sweaters, too. 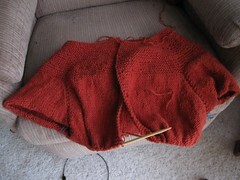 This lump of orange is the beginning of my Garter Yoke Cardigan. I made a lot of progress on it last night while catching up on the latest episodes of Ugly Betty and Bones, my two favorite shows. I came down with a cold, starting with a sore throat, on Friday, and so yesterday I tried to be as low-key as possible. Sitting around catching up on knitting fulfilled that goal wonderfully. I tried unsuccessfully to nap, hoping that getting a whole bunch of extra sleep would get me well again before Monday. I can’t afford to miss any days, really, because I need to make sure I meet my minimum tutoring requirement of at least 60 minutes per week per student, and I’ve been having trouble meeting that with my 7th graders lately. So, I can’t be sick until Wednesday, when I don’t tutor them! Well, time to get more knitting and relaxing lounging done! 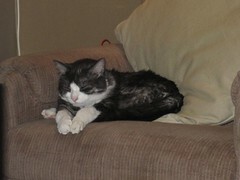 Oh, and p.s., sorry about the messy state of my living room in the background of my pictures! My brother and his friends have been driven out of the chilly basement and permanently set up camp upstairs as their video gaming headquarters. There are four TVs in there right now. Yeah. I made a sweater once. Like, I actually completed a whole sweater once. No wait, make that twice. First, I knit a sweater that looked completely horrible on me, ripped the whole thing out, and knit a whole new sweater out of the same yarn. 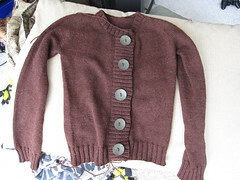 A cardigan with nice wide button bands and stuff. I finished it just after I arrived in Argentina for a semester of study abroad, but I never got buttons for it. So I never wore it. When I got back to the United States, I accidentally washed it and it felted and shrunk a little. 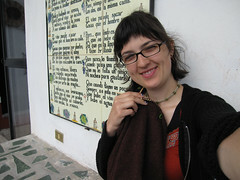 Also when I was in Argentina, I worked a lot on Thermal from Knitty. I got about halfway done with the second sleeve, lost my place, and haven’t gotten up the energy to find it and finish. Besides that, between then and now, I lost about 50lbs, so it’s not like my Thermal is going to fit anyway. Just one more thing to add to my lack of motivation. When I finally do finish that one, it’ll be a nice, cozy, oversized pullover for me. I happily picked up and knitted the entire button band, looking forward to a weekend of actually finishing a wearable sweater. Then I realized that the buttons I’d purchased were in my sewing basket, and that I’d brought my sewing basket to school for the kids in jewelry making class to use needles. So, the finishing of the sweater wouldn’t be happening that weekend. 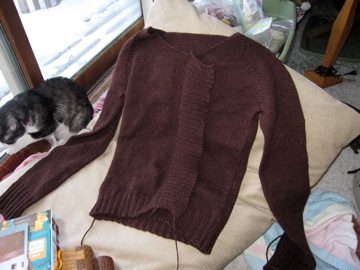 I began a swatch for another sweater in the meantime, the Garter Yoke Cardigan. I knitted on it the whole car ride up to Duluth this weekend, then had to rip back and start over, and knitted the whole car ride home. I have yet to take pictures of my progress, but that’s the swatch. I’m excited to add some new warm items to my wardrobe! Now it’s almost the weekend again and I’ve got two sweaters to work on. My first goal is to finish the one, then work on the other. Oh, the yarn is Cascade 220 Heathers for both sweaters.